Dr. Linda Fahlberg has created an excellent tutorial on embedding GeoGebra in Wikispaces. In the last advanced tutorial, we have learned how to export a GeoGebra worksheet to a Dynamic HTML. As we have observed, the GeoGebra worksheet is exported as a single page; therefore, we have very little control over it, unless, of course, we know how to code HTML or CSS. This also means that if we link the dynamic HTML to our blog or webpage, we will have to go to a new page to view it. In this post, we will assume that you have already a GeoGebra worksheet to embed. If you just want to follow this tutorial, and you do not have a GeoGebra worksheet, you can download a sample GeoGebra worksheet here and follow the instructions below. Resize the GeoGebra window so that it will fit the place where you will embed it. Note that the size of the GeoGebra window in a GeoGebra worksheet will also be the size of the applet after embedding. Select File>Export>Dynamic Worksheet as Webpage(html) from the menu bar to display the Export dialog box. 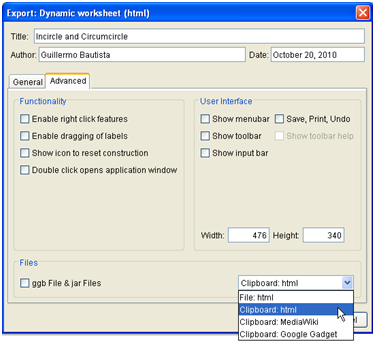 In the Export dialog box , select the Advanced tab, and then select Clipboard: HTML from the Files section.